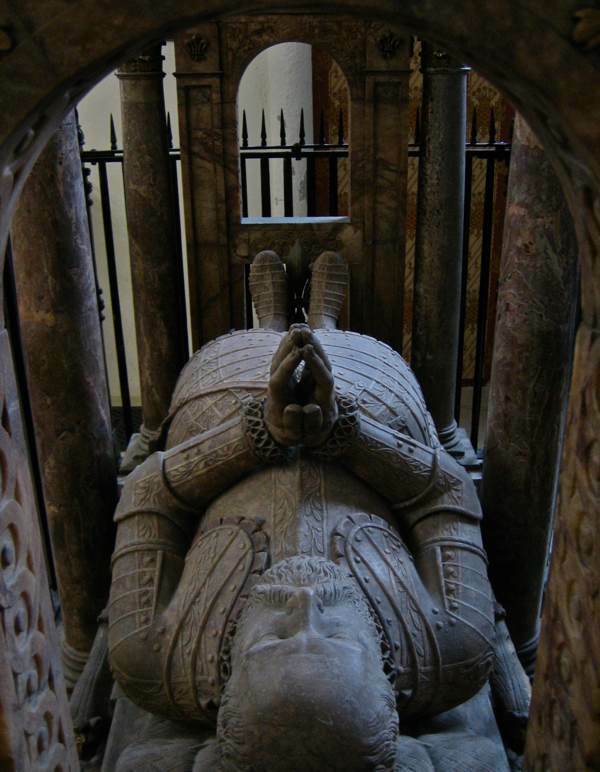 Sir William Pickering, St Helen’s, Bishopsgate, 1574. Ever since I visited the newly-discovered site of William Shakespeare’s first theatre in Shoreditch, I found myself thinking about where else in London I could locate Shakespeare. The city has changed so much that very little remains from his time and even though I might discover his whereabouts – such as his lodging in Silver St in 1612 – usually the terrain is unrecognisable. Silver St is lost beneath the Barbican now. Yet, in spite of everything, there are buildings in London that Shakespeare would have known, and, in each case, there are greater or lesser reasons to believe he was there. As the mental list of places where I could enter the same air space as Shakespeare grew, so did my desire to visit them all and discover what remains to meet my eyes that he would also have seen. Thus it was that I set out under a moody sky in search of Shakespeare’s London – walking first over to St Helen’s Bishopsgate where Shakespeare was a parishioner, according to the parish tax inspector who recorded his failure to pay tax on 15th November 1597. 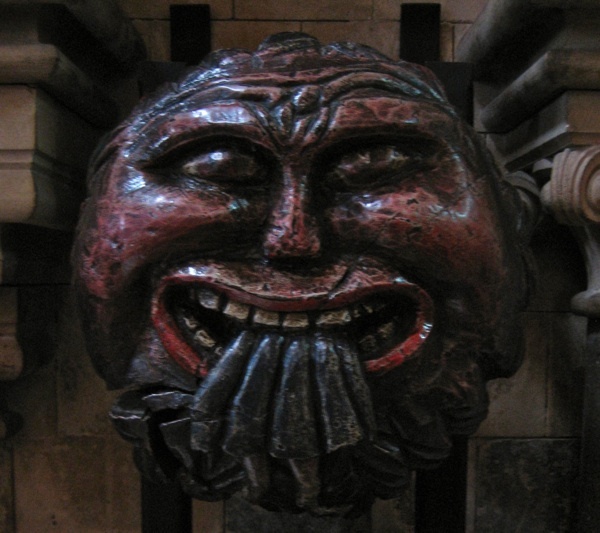 This ancient church is a miraculous survivor of the Fire of London, the Blitz and the terrorist bombings of the nineteen nineties, and contains spectacular monuments that Shakespeare could have seen if he came here, including the eerie somnolent figure of Sir William Pickering of 1574 illustrated above. There is great charm in the diverse collection of melancholic Elizabethan statuary residing here in this quaint medieval church with two naves, now surrounded by modernist towers upon all sides, and there is a colourful Shakespeare window of 1884, the first of several images of him that I encountered upon my walk. From here, I followed the route that Shakespeare would have known, walking directly South over London Bridge to Southwark Cathedral, where he buried his younger brother Edmund, an actor aged just twenty-seven in 1607, at the cost of twenty shillings “with a forenoone knell of the great bell.” Again there is a Shakespeare window, with scenes from the plays, put up in 1964, and a memorial with an alabaster figure from 1912, yet neither is as touching as the simple stone to poor Edmund in the floor of the choir. 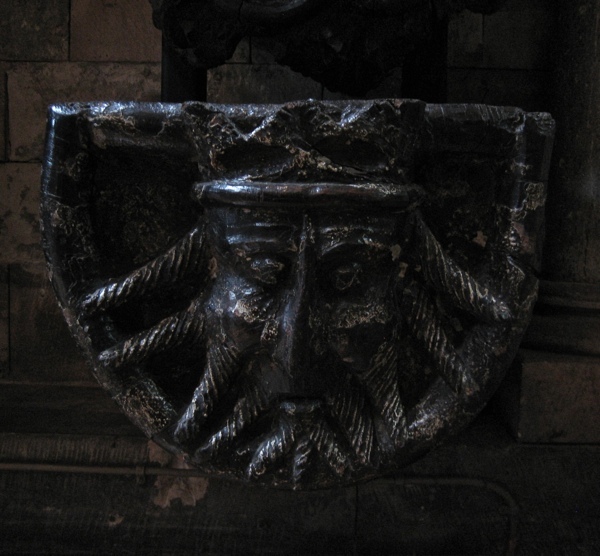 I was fascinated by the medieval roof bosses, preserved at the rear of the nave since the Victorians replaced the wooden roof with stone. If Shakespeare had raised his bald pate during a service here, his eye might have caught sight of the appealingly grotesque imagery of these spirited medieval carvings. Most striking is Judas being devoured by Satan, with only a pair of legs protruding from the Devil’s hungry mouth, though I also like the sad face of the old king with icicles for a beard. Crossing the river again, I looked out for the Cormorants that I delight to see as one of the living remnants of Shakespeare’s London, which he saw when he walked out from the theatre onto the river bank, and wrote of so often, employing these agile creatures that can swallow fish whole as as eloquent metaphors of all-consuming Time. 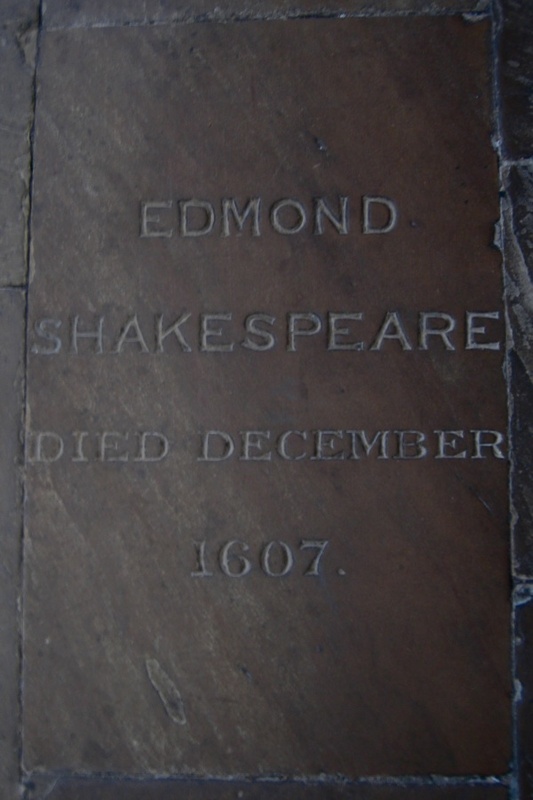 My destination was St Giles Cripplegate, where Edmund’s sons who did not live beyond infancy were baptised and William Shakespeare was the witness. 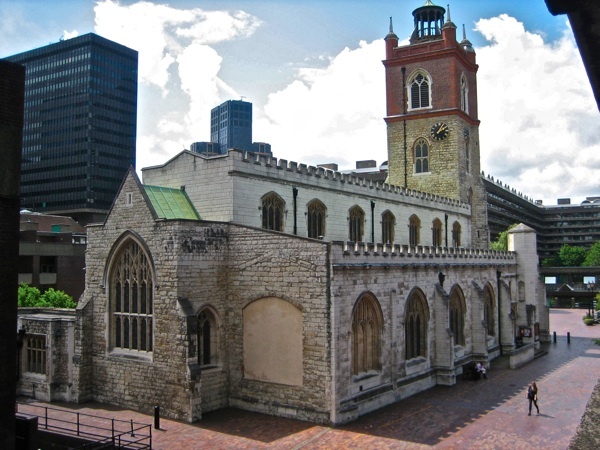 Marooned at the centre of the Barbican today like a galleon shipwrecked upon a beach, I did not linger long here because most of the cargo of history this church carried was swept overboard in a fire storm in nineteen forty, when it was bombed and then later rebuilt from a shell. Just as in that searching game where someone advises you if you are getting warmer, I began to feel my trail had started warm but was turning cold. Yet, resolutely, I walked on through St John’s Gate in Clerkenwell where Shakespeare once brought the manuscripts of his plays for the approval by the Lord Chamberlain before they could be performed. And, from there, I directed my feet along the Strand to the Middle Temple, where, in one of my favourite corners of the city, there is a sense – as you step through the gates – of entering an earlier London, comprised of small squares and alleys arched over by old buildings. 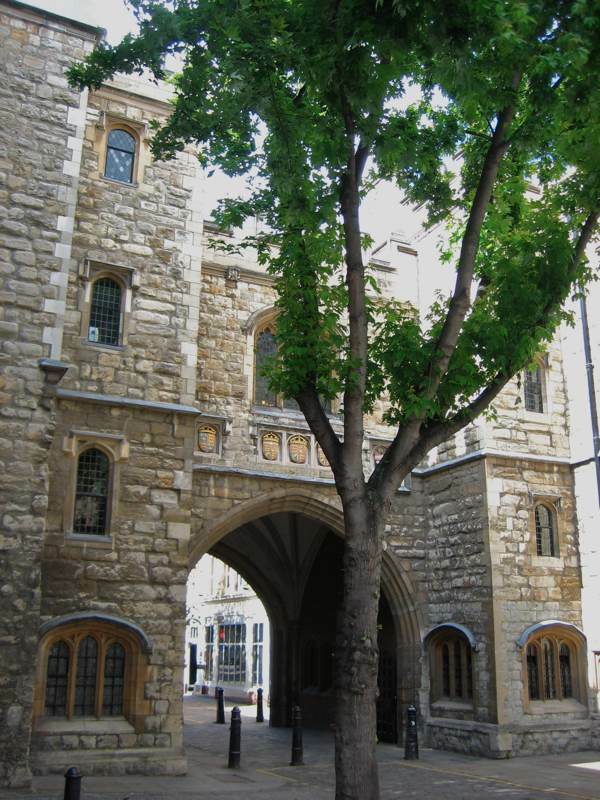 Here in Fountain Court, where venerable Mulberry trees supported by iron props surround the pool, stands the magnificent Middle Temple Hall where the first performance of “Twelfth Night” took place in 1602, with Shakespeare playing in the acting company. At last, I had a building where I could be certain that Shakespeare had been present – but it was closed. I sat in the shade by the fountain and took stock, and questioned my own sentiment now my feet were weary. Yet I could not leave, my curiosity would not let me. Summoning my courage, I walked past all the signs, until I came to the porter’s lodge and asked the gentleman politely if I might see the hall. He stood up, introducing himself as John and assented with a smile, graciously leading me from the sunlight into the cavernous hundred-foot-long hall, with its great black double hammer-beam roof, like the hand of God with its fingers outstretched or the darkest stormcloud lowering overhead. It was overwhelming. And then John left me alone in the finest Elizabethan hall in Britain. Looking back at the great carved screen, I realised this had served as the backdrop to the performance of ‘”Twelfth Night” and the gallery above was where the musicians played at the opening when Orsino says, “If music be the food of love, play on.” The hall was charged and resonant. Occasioned by the clouds outside, sunlight moved in dappled patterns across the floor from the tall windows above. I walked back behind the screen where the actors, including Shakespeare, waited, and I walked again into the hall, absorbing the wonder of the scene, emphasised by the extraordinary intricate roof that appeared to defy gravity. It was a place for public display and the show of power, but its elegant proportion and fine detail also permitted it to be a place for quiet focus and poetry. I sat on my own at the head of the twenty-nine foot long table in the only surviving building where one of William Shakespeare’s plays was done in his lifetime, and it was a marvel. I could imagine him there. St Giles Cripplegate where Edmund’s sons were baptised and William Shakespeare was the witness. St John’s Gate where William Shakespeare brought the manuscripts of his plays to the Lord Chamberlain’s office to seek approval. 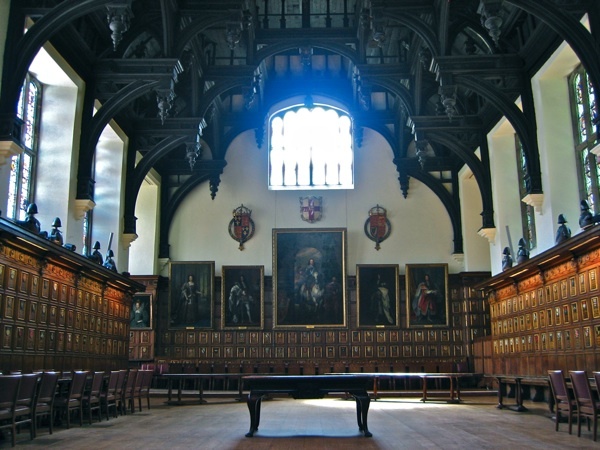 The Middle Temple Hall where “Twelfth Night” was first performed in 1602. The twenty-nine foot long table made from a single oak from Windsor Great Park. Wonderful! Thank you so much for sharing this with us. What a wonderful walk. And to be left alone in that hall! BTW have you read The Lodger, about Shakespeare’s time in Silver Street? If not, hie you to a bookseller and treat yourself. Fascinating and well researched. Enjoy the Springtime. I love Elizabethan architecture, its scale is so human-oriented. I’ve been in that hall, only once, but it has a friendly feel, seeing it again. Wonderful buildings full of amazing stories so enjoy reading your blog ,I have learnt so much about London and particularly the East End ,would love to go on your walks.Great oak table! I think you write beautifully. This one is a peach. I am sending it to my friend in Budapest, who will know about Shakespeare, but like me, will know almost nothing of his life in London, and nothing of his family life there. Terrific piece and pictures – thanks. Absolutely fascinating. I intend to retrace some of your steps–including Middle Temple Hall–the next time I’m in London. Thank you for the tour! You so well captured my favorite area of London, the Middle Temple, where one is certainly transported back in time. I was able to have alone time in the hall in the 1970′s. Still remember how awestuck I was to be where Elizabeth I experienced a Shakespeare play. The Temple Church holds many memories for me also as a place of refuge. Thank you so much for recalling such happy and comforting memories of a time I spent in London. Thanks for sharing your journey in the Bard’s footsteps. 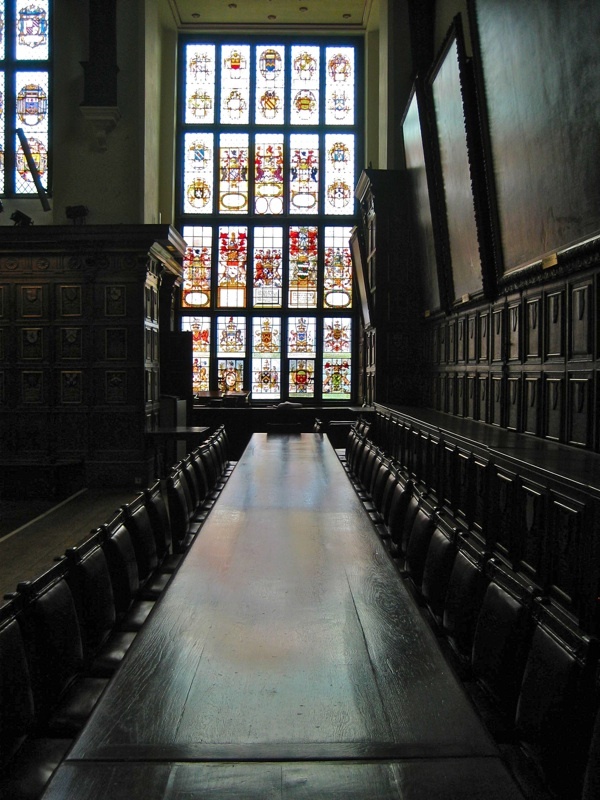 I have visited the churches and Middle Temple before but have never been in the Hall…it looks wonderful! Thank you GA. To accompany you on this walk has been the most delicious treat. 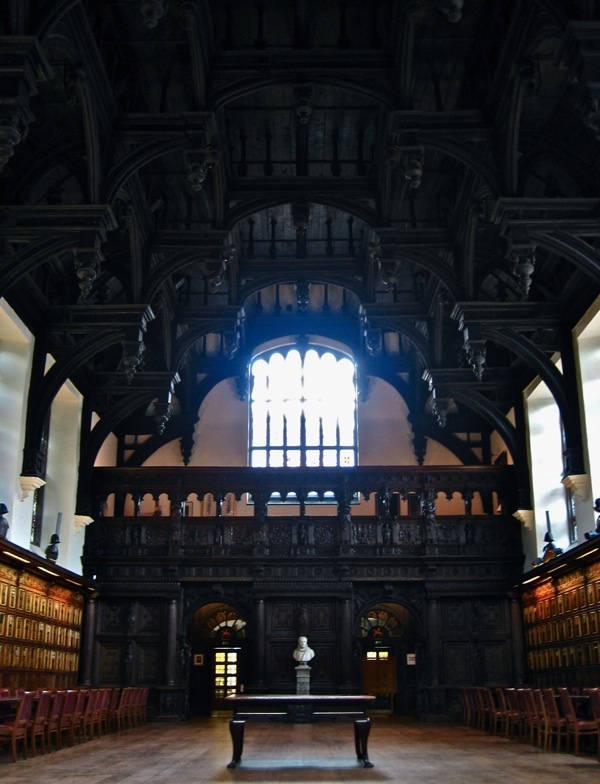 To see the inside of Middle Temple Hall, where WS himself performed, is quite thrilling. When so much of London’s material history has been lost or is under threat, these precious remnants are to be especially cherished. Can’t wait to retrace your steps this summer! What great photos. The ceiling of Middle Temple Hall is stunning. I’m surprised that there is anything left of Shakespeare’s London. Obviously the city has resisted wholesale demolitions starting in the 19th century to leave us these remnants. Would the George Inn in Southwark have been another possible venue? I made a similar journey studying in London in July of 2013. Looking for as many Shakespearean sites as I possibly could. It was part of a research project for me but I had similarly emotional reactions. I highly recommend investigating “Shakespeare’s London Theatreland” by Julian Bowsher published by the Museum of London Archaeology. It has all the Shakespearean history you would ever want to read and plenty of walks for you to go on. I also highly recommend seeing whatever show The Rose has on now. It’s a truly wonderful little venue. This should be a “Walk of London”.